In the recent years, several clinical studies have been conducted in patients of CSOM to correlate the hearing loss with the characters of the perforation such as size and site. Most authors have generally stated that the hearing loss is dependent on the site and size of perforation, but their results were found to be conflicting and inconclusive. In the studies by Kumar et al.,  and Pannu et al.,  it was observed that the degree of hearing loss increases with the size of perforation and has no relation with the site of perforation. However, Malik et al.,  in his study observed that the degree of hearing loss did not vary with the size of the perforation but was dependent on the site of perforation. Frequency dependence of hearing loss was also not correlated well with the site and size of hearing loss. Study of relationship between the site and size of perforation with the degree of hearing loss and frequencies affected. A cross-sectional prospective study design was made and sample size was set at 100 perforated ears from patients of CSOM safe. Unilateral/bilateral CSOM of safe type with no history of ear discharge for atleast 6 weeks were selected randomly irrespective of age and gender. Patients of unsafe CSOM, traumatic perforations, mixed hearing loss, and ossicular chain fixation/disruption were excluded. Prior to starting the study, all recruits were explained the nature of the study and informed consent was taken. All the cases underwent detailed history taking and ENT examination. Pure tone audiometry was done and the pure tone average of AC threshold was calculated by at 500, 1000, and 2000 Hz. The degree of hearing loss was assessed according to the WHO classification of hearing impairment. Paper patch test was done to rule out ossicular abnormality. Percentage of perforation = P/T × 100%, where P is the area (in pixels) of the YM perforation and T is the total area (in pixels) for the entire TM (including the perforation). Area of perforation in mm 2 = 90 × percentage perforation/100. The perforations were then classified into three groups based on their size: Group I (small) - area in range of 0-8 mm 2 , Group II (medium) - area in range of 8.1-30 mm 2 , Group III (large) - area in range ≥ 30.1 mm 2 [Table 1]. The TM perforations were divided into the following three categories based on their location on the pars tensa. Anterior - perforations occupying area only anterior to handle of malleus on the pars tensa Posterior - perforations occupying area only posterior to handle of malleus on the pars tensa Central - perforations occupying area on either side of handle of malleus on the pars tensa [Table 2]. Statistical analysis with one-way analysis of variance test and multiple comparisons Tukey's honestly significant difference was done. The criteria for statistical significance was set at P < 0.05. A total of 63 patients with unilateral or bilateral disease (total ears = 100) were found suitable and included in the study. The age group of patients in the study ranged from 10 to 56 years with maximum involvement in younger age groups. Females and bilateral involvement was more common. Otorrhea was the most common presenting complaint. The demographic profile of the patients is described in [Table 3]. On basis of area three groups of perforations were made. Maximum number of patients were seen in Group III (43), followed by Group II (39) and Group I (18) [Table 1]. Three groups of perforations were made based on their location in relation to the handle of malleus. Maximum number of patients were seen in central group (69), followed by posterior (16) and anterior (15) groups [Table 2]. The hearing loss ranged from 23.3 dB to 45 dB in all 100 ears. Based on WHO grades of hearing impairment, the ears were classified and maximum ears were seen to have a mild hearing loss (81 ears), followed by moderate loss (16 ears) and normal hearing (3 ears) [Table 4]. Irrespective of site and size of perforation the hearing loss was observed to be highest at the frequency of 500 Hz, that is, 41.05 ± 6.32 dB and lowest at 8000 Hz, that is, 22.72 ± 8.84 dB. The frequency of 2000 Hz was seen to be least affected in comparison to its adjacent frequencies. In our study, it was observed that with increasing size of the perforation the degree of hearing loss increases. 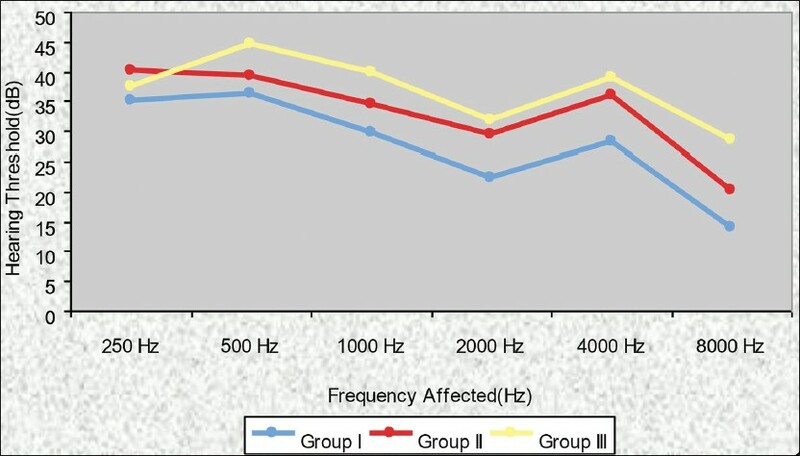 Mean hearing loss in each group was as follows, Group I: 29.41 ± 4.39 dB, Group II: 34.69 ± 4.96 dB, and Group III: 38.79 ± 3.44 dB, respectively (P value 0.000, highly significant, [Table 1]). In our study it, was observed that posterior perforations have the greatest hearing loss, that is, 39.99 dB ± 2.79 dB, followed by central perforations, 35.64 ± 5.31 dB and anterior perforations, 30.1 ± 2.98 dB, respectively (P value 0.000, highly significant). It was observed that the hearing threshold was highest at 250 Hz for Group II perforations and at 500 Hz for Groups I and III perforations. All three groups had the lowest hearing threshold at 8000 Hz. Hence, the relationship between size of perforation and frequencies affected is not a linear rising line [Figure 1]. Highest hearing threshold was seen at 250 Hz in anterior perforations and at 500 Hz for central and posterior perforations. Again, 8000 Hz was the least affected frequency [Figure 2]. In patients with perforated TM, a precise otoscopic examination with special attention to perforation size and location would enable us to predict the expected hearing loss. If the clinical judgment and audiometry findings differ, a high index of suspicion of underlying middle ear pathology should be kept. The goal of our study was to validate the existing suppositions and fulfill lacunae of scientific research in this field. Our study showed that the highest incidence of CSOM was seen in patients in younger age group (15-24 years). Our observation was similar to studies of Shyamala and Reddy  and Agrawal et al. This finding can be explained by presence of a straighter and shorter Eustachian tube More Details in children predisposing easy passage of infection from nose to ear, lower immunity and recurrent upper respiratory tract infection (URI's) in this age group. Also, the number of females in the study group was higher than the number of males (male: female ratio was 3:4). Our results differed from the studies of Singh et al.,  and Afolabi et al.,  where a male preponderance was seen. This variation could arise due to difference in literacy levels in different geographical locations where women visit hospitals less frequently. B/L involvement was more common in our study, possibly due to presence of large number of younger population in the sample, where causes like adenoid hypertrophy or recurrent URI's in childhood would have predisposed to bilateral disease. Otorrhea was the most common presenting complaint, consistent with other studies as that of Kumar et al. Until recently, the effects of TM perforations on middle-ear sound transmission were not well-characterized and there was no general agreement among clinicians about the magnitude and the configuration of the hearing loss that is caused by various types of TM perforations. In our study, the hearing loss ranged from 23.3 to 45 dB. Other studies, those by McArdle and Tonndorf  and Merchant et al.,  observed the hearing loss to range from negligible to 50 dB in cases of central TM perforations. It has also been noted that our audiograms revealed a consistent frequency pattern, similar to an inverted V shape of the audiogram with a turning point around 2000 Hz irrespective of the site and size of the perforation. Below 2000 Hz, the ABG is larger for the lower frequencies, and above 2000 Hz, the ABG gets bigger again in the higher frequencies. These observations are similar to those made by Lerut et al. As the inherent frequency of the TM has been calculated to be at 2000 Hz, that is, the TM vibrates the most at 2000 Hz, the least loss of sound transmission (or best hearing) has been observed around 2000 Hz. When comparing the various sizes of perforation with the degree of hearing loss, it was observed that the hearing loss increases with increasing size of perforation. Results were comparable with studies of Kumar et al.,  and Pannu et al. ;  however, Mallik et al.,  in his study observed that there was no relation between the size of perforation and the degree of hearing loss. The primary mechanism of hearing loss due to a TM perforation is a reduction in the ossicular coupling caused by a loss in the sound pressure difference across the TM. We observed in our study that hearing loss was more in posterior perforation, followed by central perforations and anterior perforations. This view has been supported by Bianca et al., and Malik et al.,  in their studies. They attributed this effect to the direct exposure of the round window to the sound waves resulting in cancellation of the phase difference between the two windows and resultant nonmovement of perilymph. However Pannu et al.,  and Kumar et al.,  differed from this view in their study and suggested that location of perforation does not affect the degree of hearing loss. Our results are comparable with other studies in general that lower frequencies are affected more than higher frequencies. Yet, no other study has made observations over such a wide range of frequencies as ours; hence, more research is needed in this area to compare our findings. A linear relationship between perforation size and frequency affected could not be established. Small and large sized perforations had highest hearing threshold at 500 Hz and moderate size perforation were worst affected at 250 Hz. All three sizes had the lowest threshold at 8000 Hz. Our findings are similar to those of Ahmad and Ramani  who observed greater hearing loss in the lower frequencies, increasing with the size of the perforation. However, Austin  stated that the presence of perforation does not significantly affect the frequency response of the middle ear, since a flat hearing loss was observed for the frequencies studied for each size of perforation. 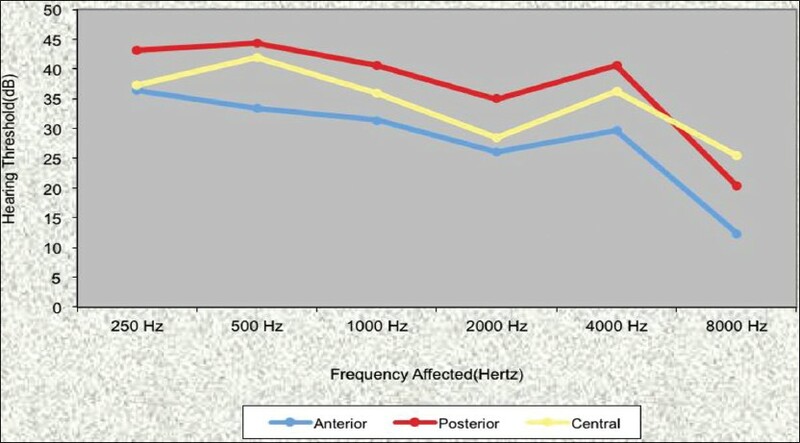 Effect of site: Anterior perforations had a higher hearing threshold at 250 Hz, whereas 500 Hz was worst affected in central and posterior perforations. Bhusal et al.,  observed that hearing loss is greater in lower frequency when compared with higher frequencies, for all sites of perforation. Matsuda et al.,  observed frequency dependence of hearing loss and the highest hearing threshold was of the perforations in anteroinferior quadrant. A TM perforation usually causes a range of hearing loss, from mild to moderate. Our study gives a first hand knowledge about when to expect a plain TM perforation and when to look for a middle ear pathology based on closely observing the pattern of hearing loss in the patient. From our study, we concluded that the hearing loss increases with increasing size of perforation and with a posterior location on the TM. Also, frequency dependence of hearing is a complex phenomenon based on several interrelated parameters. 2000 Hz being the inherent vibrating frequency of the TM is least affected in comparison to its adjacent frequencies. This study aimed at giving us an insight into various patterns of hearing loss in different types of perforations. A thorough knowledge of these attributes would allow us to decide upon the most effective interventions for the patients of CSOM at the correct time. 1. Hamilton J. Chronic otitis media in childhood. In: Gleeson M, Browning G, editors. Scott-Brown′s Otorhinolaryngology, Head and Neck Surgery. 7 th ed., Vol. 1. London: Edward Arnold publishers; 2008:929. 2. Acuin J. Chronic suppurative otitis media: Burden of illness and management options. Geneva: World Health Organization; 2004:14. 3. Wever EG, Lawrence M. The transmission properties of the middle ear. 1950. Ann Otol Rhinol Laryngol 1992;101:191-204. 4. Payne MC Jr, Githler FJ. Effects of perforations of the tympanic membrane on cochlear potentials. AMA Arch Otolaryngol 1951;54:666-74. 5. Voss SE, Rosowski JJ, Merchant SN, Peake WT. Middle-ear function with tympanic-membrane perforations. I. Measurements and mechanisms. J Acoust Soc Am 2001;110:1432-44. 6. Mehta RP, Rosowski JJ, Voss SE, O′Neil E, Merchant SN. Determinants of hearing loss in perforations of the tympanic membrane. Otol Neurotol 2006;27:136-43. 7. Kumar N, Chilke D, Puttewar MP. Clinical Profile of Tubotympanic CSOM and Its Management With Special Reference to Site and Size of Tympanic Membrane Perforation, Eustachian Tube Function and Three Flap Tympanoplasty. Indian J Otolaryngol Head Neck Surg 2012;64:5-12. 8. Pannu KK, Chadha S, Kumar D, Preeti. Evaluation of hearing loss in tympanic membrane perforation. Indian J Otolaryngol Head Neck Surg 2011;63:208-13. 9. Malik S, Ashrafi K, Sohail Z, Afaq S, Nawaz A. Determinants of variable hearing loss in patients with chronic suppurative otitis media. Pak J Otolaryngol 2012;28:45-7. 10. Shyamala R, Sreenivasulu Reddy P. The study of bacteriological agents of chronic suppurative otitis media-Aerobic culture and evaluation. J Microbiol Biotech Res 2012;2:152-62. 11. Agrawal A, Kumar D, Goyal A, Goyal S, Namrata Singh N, Khandelwal G. Microbiological profile and their antimicrobial sensitivity pattern in patients of otitis media with ear discharge. Indian J Otol 2013;19:5-8. 12. Gaur RG, Mathew J, Varghese AM, Mathew G, Chandrasekharan R, Anandan S. Microbiological pattern of ear swabs in chronically discharging ears in a tertiary care hospital in India. Indian J Otol 2013;19:51-4. 13. Afolabi OA, Salaudeen AG, Ologe FE, Nwabuisi C, Nwawolo CC. 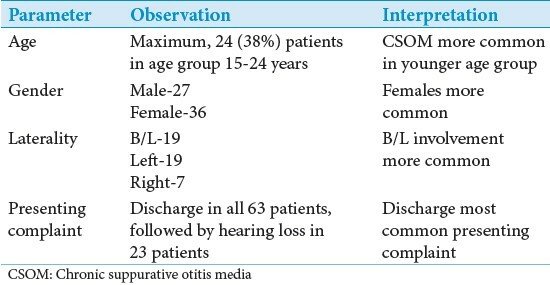 Pattern of bacterial isolates in the middle ear discharge of patients with chronic suppurative otitis media in a tertiary hospital in North central Nigeria. Afr Health Sci 2012;12:362-7. 14. McArdle FE, Tonndorf J. Perforations of the tympanic membrane and their effects upon middle ear transmission. Arch Klin Exp Ohren Nasen Kehlkopfheilkd 1968;192:145-62. 15. Merchant SN, Ravicz ME, Puria S, Voss SE, Whittemore KR Jr, Peake WT, et al. Analysis of middle ear mechanics and application to diseased and reconstructed ears. Am J Otol 1997;18:139-54. 16. Bigelow DC, Swanson PB, Saunders JC. The effect of tympanic membrane perforation size on umbo velocity in the rat. Laryngoscope 1996;106:71-6. 17. Bhusal CL, Guragain RP, Shrivastav RP. Size of tympanic membrane perforation and hearing loss. J Nepal Med Assoc 2006;45:167-72. 18. Lerut B, Pfammatter A, Moons J, Linder T. Functional correlations of tympanic membrane perforation size. Otol Neurotol 2012;33:379-86. 19. Bianca N, Doina V, Ermil T. Annals of the University of Lower Danube Galati, MEDICINE Beam XVII, 2011;2:17. 20. Ahmad SW, Ramani GV. Hearing loss in perforations of the tympanic membrane. J Laryngol Otol 1979;93:1091-8. 21. Austin DF. Sound conduction of the diseased ear. J Laryngol Otol 1978;92:367-93. 22. Bhusal CL, Guragain RP, Shrivastav RP. Frequency dependence of hearing loss with perforations. J Nepal Med Assoc 2007;46:180-4. 23. Matsuda Y, Kurita T, Ueda Y, Ito S, Nakashima T. Effect of tympanic membrane perforation on middle-ear sound transmission. J Laryngol Otol Suppl 2009:81-9.